If you’ve ever looked at a celebrity and wondered how they get that Hollywood smile, the secret could be more than good genes. In fact, there could be much more to a beautiful smile than meets the eye thanks to the wonder of dental veneers. With one simple cosmetic treatment, it is possible to completely transform the appearance of discolored and misshapen teeth into a dazzling white smile that makes a lasting impression. The even better news is that you do not have to travel out-of-state to get it. You can get cosmetic veneers right here in Houston from the team here at Briter Dental. Veneers are very thin shells of material that are shaped and bonded to the front of the teeth. They are used to enhance the appearance of the teeth, altering not only their shape, but also their size, color, and texture. This allows for total transformation of a patient’s smile with as little damage to the natural teeth as possible. There are two different types of veneers – composite and porcelain. Composite veneers are sculpted directly onto the teeth in your dental office, usually to repair minor tooth damage or to fill in small gaps. These are the simplest to apply – typically is just one visit. However, composite veneers are not resistant to staining, therefore requiring greater effort to maintain their appearance. Porcelain veneers are capable of much more extensive cosmetic alterations and often used in total smile makeovers. Because they are created using a dental lab and advanced technological planning, patients can typically view the final result before treatment begins. Patients are fit for veneers over the course of several office visits, during which the original teeth may be shaped and drilled in preparation of treatment. The final result is typically a polished, beautiful smile that is resistant to staining and chipping. In most cases, veneers last several years – often as much as a decade or more with proper care. Even if a veneer does detach, however, it is often capable of repair with a visit to our office. 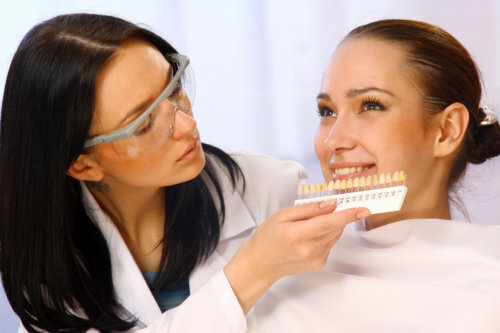 Here at Briter Dental, we consider veneers to be an investment in a patient’s quality of life. However, only your cosmetic dentist can help you determine if veneers are the right treatment for you. Contact our office for more information about Houston veneers and to schedule your consultation today.